RUSH: So, folks, I just want to prepare you. I know to some people it’s immature, it may be unseemly, it may seem insecure. It’s not any of that. I have been making predictions, and I should call those predictions warnings, it’s actually what they have been, about the media, about Obama, about the intentions of both, their intentions toward the Republicans, what Obama’s grand vision is. I have been warning and doing so under the guise of predictions for a lot of things, for four years. But some intense stuff that I’m gonna address here today, at least in the last three to four weeks, even going into last year. I’m gonna spend some time explaining it. It’s not because of insecurity. It’s not because of immaturity. It’s not because I want to be childish or go nah-nah-nah-nah-nah-nah, “See, I told you so,” none of that. It’s because I want you to know that when I predict something, I’m warning, and I want you to know that you can trust it. I want you to know that you can have faith in it. That I’m not saying things just to say them. That I’m not trying to be outrageous just for the sake of it. That I am genuinely concerned about these things and warning you about it for whatever good that ends up being. Some will say, “You’re just doing this because you’re mad that everybody in the media is stealing your stuff.” No, I’m not. That’s what I mean. I’m not being childish about it. I’m not being immature. I know that with as many media people as there are and as many pundits offering opinions, it’s really difficult to claim originality. I’m not gonna go through this because I’m upset people are stealing from — I don’t look at it that way. It’s not the point. I do want to establish to you that I know what I’m talking about that. When I issue these warnings and red flags, that you ought to listen to it. It’s nothing more than my desire that you trust me and believe what I’m telling you so that you can be on the cutting edge, be informed, be aware of what’s coming, for whatever good it’ll do you, but that’s really the reason. We arranged a cortisone shot. I had a cortisone shot on Friday and the first 24 or 36 hours it didn’t work very well. I said, “Awe, jeez, maybe this isn’t what it was.” Then all of a sudden it kicked in, and it’s like I’m brand new today. Today is really the first day that I have some — I mean, if you’re watching on the Dittocam, I couldn’t do this. I couldn’t pull my arm straight out. I couldn’t reach behind my back. I couldn’t put on a suit jacket or any of that. Now I’m back. Then Condoleezza Rice is out saying the GOP’s doing this or that, making a mistake here on immigration. It became clear, folks, that you and I who are conservatives, we’re becoming more and more marginalized and isolated on a little island here and it’s very small and it’s adrift out in the middle of nowhere. We’ve got people jumping ship left and right. Our own island, we got people jumping off our own ship. I mean, the number of us who exist as we are who are fearless in trying to explain exactly what’s going on each and every day are dwindling in number in the media. Now, I don’t know about you. I don’t get that sense with you based on the feedback I get from you. So, anyway, I knew also that when I got here today that Cookie would have watched the inaugural festivities and she would prepare for me the audio sound bite roster that had all the stuff. Kathryn is sending me texts yesterday while I’m out on the deck. “Boy, you ought to be very glad you’re not watching CNN. You wouldn’t be able to handle it.” I said, “Probably not.” They were fawning over Obama. There’s no pretense these people are journalists anymore. Tom Foreman, ever heard of him, Snerdley? I have. He’s a CNN reporter. We’ve learned he has written a letter to Obama every day of the last four years, love letters, “Dear Santa Claus” letters. Al Roker practically messed in his pants against yesterday when he got the first car-side interview with Obama in the inaugural parade. It is unlike anything I have ever seen. There is not even any pretense anymore in the media of being dispassionate or objective, and I’m telling you, when I warned you last week and the week before, you’re gonna hear it coming up in the sound bites. I predicted, I warned you that the agenda, the number one item on the Obama Democrat Party media agenda is the destruction of the Republican Party, is the elimination of any opposition. And I said to myself, “Boy, it’s a good thing we got the tax issue off the table. It’s a good thing we put the tax issue behind us. It really is stunning.” I know there are people who say, “Well, be patient, Rush, Obama, they’re overreaching. They’re setting themselves up, when this kind of stuff happens, you know, karma comes along and smacks everybody down.” Folks, I’ve been waiting for karma to fix what’s wrong for 25 years. The cultural rot continues to rotten and deepen. Everything that we think is wrong culturally, politically, continues to deteriorate, and there doesn’t seem to be a low point at which people say, “You know what, enough.” We just keep trending downward. Just seem to be headed in that direction. So I want to demonstrate and give you examples of all this as the program unfolds. I don’t feel that way about anybody. There’s not a human being I could get close to that I would go gaga over, other than me. If I could get close to me the way you do, yeah, I’d go gaga. Snerdley, is there someone, is there an athlete, is there a movie star, is there anybody that you could get within five feet of and maybe talk to that you would stop everything and send out tweets and letters, going gaga over it? “Oh, my God, oh, my God!” No, there isn’t. Me either. Well, maybe Justin Bieber. I have to be honest. Maybe Justin Bieber. Maybe Kim Kardashian, but, I mean, aside from that, folks, there isn’t anybody. You know, and at the George W. Bush inaugurals these guys look like they’re covering funerals and they’re all depressed and so forth. Listen to this montage. I’ll tell you who we got. We got Al Roker. We got Tamron Hall, Jim Acosta, he’s the guy that wrote, “Oh, my God, oh, my God, I could reach out and touch Obama, like five feet away, oh, my God.” Kate Baldwin, CNN, Wolf Blitzer, Brian Williams, Diane Sawyer, Cokie Roberts, Bob Schieffer, Scott Pelley, Jon Meacham, the Rice University presidential historian Doug Brinkley, Piers Morgan, all here talking about the excitement of Obama’s second inauguration. ROKER: Mr. President! Mr. President! Mr. President! This is so exciting. HALL: Just exciting, an inspiration to be here. Acosta: I feel like I should pinch myself right now. Mitchell: Pretty exciting for all of us out here. CURLEY: I tell you what George, this is pretty exciting. GUNN: A thrilling, thrilling morning. (laughter) Very exciting. BOLDUAN: See if the President can see us. BLITZER: Mr. President. Mr. President. (Bolduan tries to interrupt) I saw the First Lady, there’s the First Lady over there. Well, you know, we’re spectators. We’re tourists here in Washington. WILLIAMS: America threw itself a party today. SAWYER: This great pageant of a day in American democracy. ROBERTS: It’s a day to say congratulations, United States of America. It is a wonderful moment. SCHIEFFER: It was a perfect day. The crowds were large, they were joyous. PELLEY: An amazing day in Washington. MEACHAM: A magical moment in a second term that begins today. BRINKLEY: It’s amazing how beloved Barack Obama is by the African American community. MORGAN: It’s an amazing moment to have a black president being re-elected, and re-inaugurated on Martin Luther king day. RUSH: Piers Morgan, why, you heard it, you heard it, and they will never get over the fact that he’s the African-American. That’s the single most important thing about him. The second thing is he’s a liberal. So we are dealing here with a cult figure. Now, I know some of you cynic leftists in the audience, “Come on, Rush, you know that if it was Reagan being inaugurated, and you got within five feet, you’da come on the radio the next day going gaga.” I don’t know, I’m gonna be honest, but I’m gonna tell you, I’m not a journalist. I’m not pretending to be dispassionate about all this. I’m not pretending to be an objective chronicler of events. It’s demeaning to these people. But they don’t see it that way at all. What would Edward R. Murrow say? Edward R. Murrow would be leading this parade. 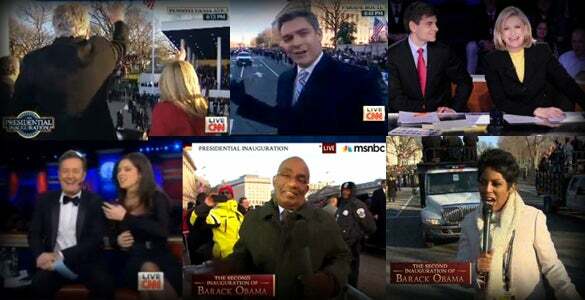 Walter Cronkite would be leading this parade. What do you mean, what would Edward R. Murrow say? No difference. Anyway, folks, I’m serious now. This isn’t sour grapes, envy, jealousy or any of that. This is real concern that I feel for the country, real concern. But I’m being told, “Don’t say the country’s in peril. That’s just gonna send people running to Obama.” Not so much the country. I guess values and standards. I don’t know. It’s tough to put my finger on. But I don’t get this way over anybody. I gotta take a break. But there’s much more coming up. I mean, next we have a bunch of people talking about how the objective here is Obama is gonna transform the country, just like Reagan was transformative, Obama’s gonna. Now, this is something I have been predicting and warning and analyzing for months, and it’s conventional wisdom now. RUSH: I don’t think the news media has been this happy since they forced Nixon to resign. And that’s a tough contest. I mean, when were they happy? That was orgasmic nirvana for them back then, but I think this is even a bigger deal, because there’s so much involved in this. I mean, all the pretense is gone. It’s not just that Obama won, and it’s not so much what Obama’s plans are. It’s not so much what Obama’s agenda is, other than — and I mean this and I’ve never been more serious. I think the number one objective for these people they think has been met, and that is the elimination of any viable opposition to Obama. I think they really are ecstatic and happy over what they think now is the final nail in the coffin of conservatism. I think that has been the prime motivating factor for many people in the media, the biggest objective. The biggest obstacle to them has been domestic political opposition and eliminating it, getting rid of it, discrediting it, making it infinitesimally small. I think that’s what they’re really celebrating. Obama is the vessel for it, and Obama fits the bill. I mean, he’s the first African-American president, the glib, they think he loves them. It’s just all made to order. It is as though they have conquered the country and that they alone run it, and they’re drunk with power and delirious with that achievement, and they think it’s final. They think it’s over. They think it’s the end of the NRA, the end of the pro-lifers. It’s the end of any viable, serious opposition to them on anything. They think it’s happened. And to the extent that there’s still pockets of opposition, they feel confident they can take that out, too. They’re very confident. They see more and more conservatives caving, basically conceding and walking away from any opposition. I mean, it’s amazing. They are deliriously happy and it is the universe in which we find ourselves. Primarily it’s an Inside the Beltway phenomenon, but that’s how they perceive the whole country to be going.